As senior surgeon on board Discovery, Dr. Reginald Koettlitz played a vital role in the heroic period of polar exploration when Nansen, Amundsen, Shackleton and Scott dominated the headlines. He was awarded a medal by the Royal Geographical Society for his role in the Discovery Expedition, 1901–04. During the earlier successful three-year Jackson-Harmsworth Expedition to Franz Josef Land, Koettlitz fine-tuned his measures to prevent scurvy, became an experienced ski runner, dog and pony handler and expert in polar survival. These skills were available when Koettlitz was appointed senior surgeon on the Discovery Expedition led by Scott, but due to personal reasons and the inability to acknowledge Koettlitz’s polar experience, both Scott’s expeditions were beset by major life-threatening issues that Koettlitz had faced and resolved on Franz Josef Land. On the ill-fated Terra Nova Expedition Scott and his four companions died on their failed attempt to be the first to reach the South Pole. In addition, Koettlitz travelled across north-east Africa from Berbera to Cairo on foot, mule and camel, crossing the Blue Nile to Khartoum shortly after the Battle of Omdurman. Before leaving for South Africa he assisted Shackleton in planning the Nimrod Expedition which almost resulted in the South Pole being reached. This well-researched account is enriched with previously unseen archive material such as correspondence with Nansen and photographs relating to polar history during the period 1890–1916. With the 100th anniversary of the death of R.F. 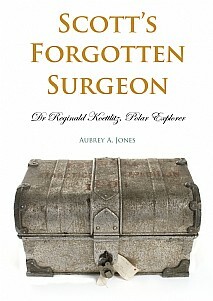 Scott and his companions in March, 2012, Scott’s Forgotten Surgeon will be of huge appeal, especially for those interested in polar history and exploration, biography and travel.